Serious question here… what the hell is wrong with these people? Anyone who believes Mike Pence actually plotted a coup against President Trump is impaired. It’s just not true, no matter how much the Atlantic wants it to be. But that doesn’t stop them from pushing this crap. You know what the headlines on Pence are today? Newsweek: “Mike Pence once ratted outed his fraternity brothers for having a keg.” Yeah, these people are seriously unhinged. Back when Trump’s Access Hollywood tape was released, many Republicans thought that was it for him. That included me. I was wrong and so were a lot of other people. A new report by unnamed Republican sources (funny how they never name them), says that at that point Mike Pence plotted a coup against Trump to take over the nomination. If you believe that, I have some prime ocean property in Nevada for you. The report claims that a number of Trump’s advisers thought he was done for. Gee, I don’t remember it that way. Momentum was building for Trump and literally nothing could stop him… especially Hillary Clinton. 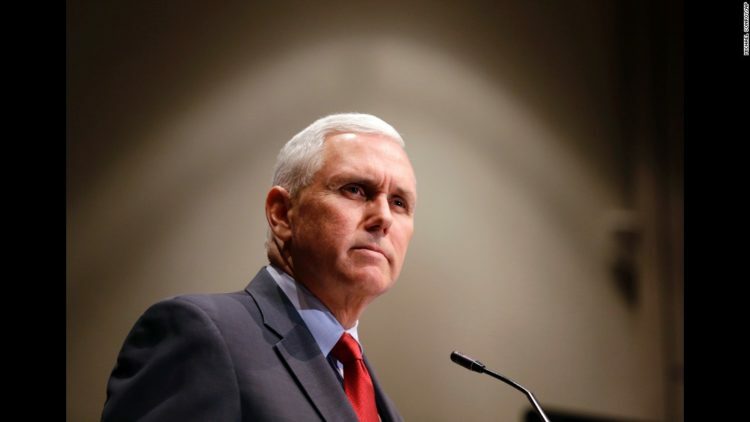 The left hates Mike Pence because he is a devout Christian. They fear him. Thus, they keep making him out to be what they are… a manipulative power monger. Nothing could be further from the truth here. The Atlantic is the one airing this bogus hooey today. No surprise there. They lie and post fake news on a regular basis. Between the Washington Post and the Atlantic, you would think the world was ending for Trump every thirty seconds or so. Not so much. According to the Atlantic, just hours after the Washington Post broke the story, “Pence made it clear to the Republican National Committee that he was ready to take Trump’s place as the party’s nominee.” Give it a rest guys… you’ve been pushing this bogus story since before Trump was elected. It’s getting very old. A former campaign aide said Pence’s wife, Karen Pence, was ‘disgusted’ by the tape. Now, that part could very well be true, but it did not affect Trump’s trajectory at all. I’ve watched Pence’s wife with Trump, so I’m extremely doubtful on this next part. “She finds him reprehensible—just totally vile,” the aide said of President Trump. The couple was appalled by the video, according to the report. I’d love to know who this ‘aide’ is. 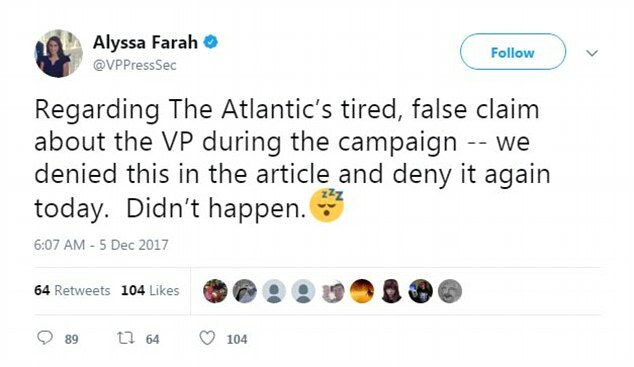 Pence’s spokeswoman Alyssa Farah tweeted: “Regarding The Atlantic’s tired, false claim about the VP during the campaign — we denied this in the article and deny it again today. Didn’t happen.” She included a sleeping emoji. And I believe her. Many urged Trump to drop out at one point or another, but once Pence was chosen by Trump, he stood by Trump’s side steadfastly. What is interesting about the Atlantic’s article, is even though they mention ‘coup’, they don’t mention any plotters or a plan to confront the nominee or otherwise force him out. This is the very epitome of fake news and the Atlantic should be ashamed. They won’t be of course… they are a commie leftist rag. I hate to break it to you leftists, but Pence is loyal to President Trump. There are no shadowy plans to take anyone out or to betray the President. They are busy doing their jobs and working to improve life in the US and undo Obama’s damage. There never was a coup plot by Pence. In your dreams.